And so it begins. Our Wonders of the World are upgraded constantly and are quickly nearing level 50. Our Wonder of the World only just reaches level 38, when a massive offense is launched on it by the alliances “xtools” and “TR-WW”. Looks like tough times lie ahead. I’m not quite sure what to make of the other alliances, yet. “|bob|” of “xtools”, who is also building a Wonder of the World, is a face already familiar to me from the Alpha. At the time, two alliances got the win by merging just before the end. I really hope, such a thing won’t be pulled off again in the Closed Beta. The other alliance, called “TR-WW”, is busy attacking and it does beg the question, why so many big armies can be found on the server – possibly because of a lack of battles between different kingdoms. TR does however only play a small part in our battle for victory. Nonetheless, we don’t take their attacks lightly. The massive attacks of the enemy alliances have, despite our good defense, caused considerably damage to our Wonders of the World. “Judith’s” Wonder is only at level 17 now and “alb’s” Wonder has also taken a big blow. Of course we won’t let those setbacks affect us. Everything is still to play for, since none of the Wonders of the World have reached level 30 or higher. 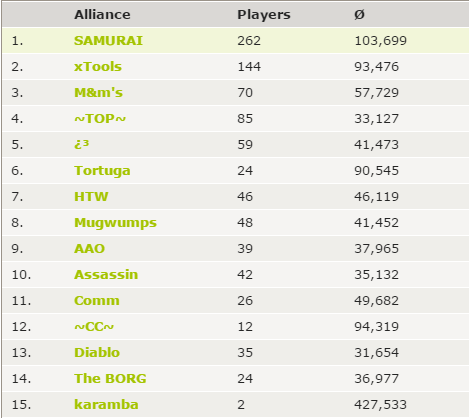 The enemies of “xtools” may have currently taken the Wonder of the World ranking’s lead, but in the alliance ranking, we, the “SAMURAI” are still ranked first with just over 9 million victory points. In order to remain in that place, we summon a war council and talk about actively attacking the others has now started. The easy days are over; our first larger hammers are on the way to the Wonders of the World of “xtools”. It looks like almost all troops of that alliance have come together there – be it offense or defense. We are only able to cause a bit of damage and it’s still a long way to reach rank one. Besides planning and executing counterattacks, our focus is of course also on the quick reconstruction of the Wonders of the World. It hasn’t quite worked as well recently, so we have to do with ranks two, four and five for the time being, while “xtools” are ranked first and sixth. According to the statistics, we are however still first when it comes to alliances. Our lead has come down to 1.5 million victory points, though. We’ve got to stick together and defend all our Wonders of the World, in order to prevent a further drop in the rankings and the loss of victory points coming with it. Good coordination in our alliance chat allows us to send the troops of alliance members from one Wonder to the next, in order to defend against incoming, big attacks. This logistic effort soon starts to pay out. We can hold our position and even make up some ground. How did you experience communication in the endgame via the in-game chat? Is it a positive new feature or rather unnecessary and hindering game play? Leave us a comment.